Home › Uncategorized › Two for two! So earlier i stated that the goal for this trip was to get back to WA with one win in the two games we went to this weekend in ‘sconsin. Well, we went 2 for 2 on that goal! The brewer game (aside from the frigging parking fiasco) was awesome too. We got to see (future NL MVP!) Prince Fielder hit home run #48 on the year (he hit #49 and #50 tonight! ), we got to see (future NL Rookie of the year!) Ryan Braun hit a home run, got to see lots of run production, lots of offense, some great defense, and a sausage race! 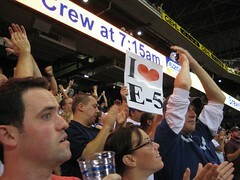 We also saw some of the funniest signs i’ve seen at a sporting event, with the clear winner being a couple rows behind us, with the “I (HEART) E-5” ryan braun sign! It was very handy when he had an error later, and a home run to avenge himself after that..
Best off all, the cubs lost today, and the brewers won again, so its down to 2 games back with 5 to go! how close can you idiots make this! Updated:Here’s the flickr photo set for the brewer game!